Blogger took a major step today with a rebuild and modernization using the latest web technologies, HTML5 and CSS3. If your blog is hosted on Blogger be sure to check out what is new. You just may want to restyle the looks of your blog. There are seven new designs with plenty of ways to customize the look and feel. You owe it to yourself to explore the possibilities. Be sure to check out the backgrounds and other features. 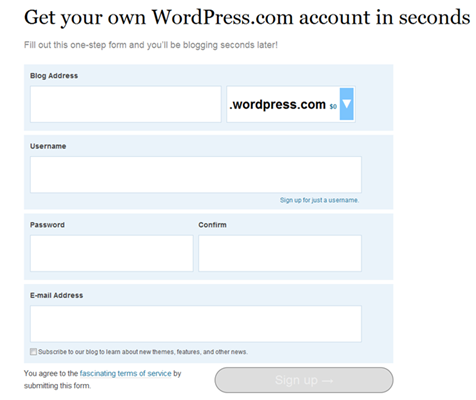 Once you have decided on a new look and clicked “Apply to blog” on each option page, there is one more important step. 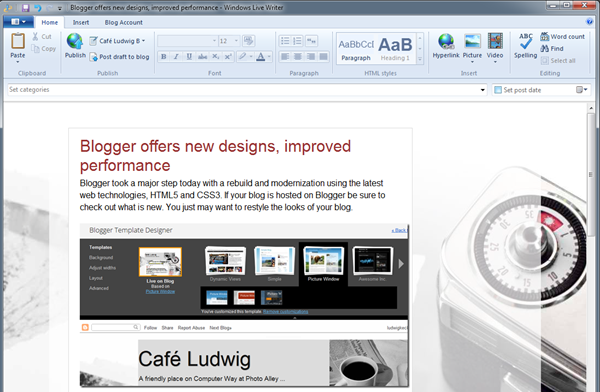 Open Windows Live Writer, click the Blog Account tab. Then click Update theme. Moments later you will see your Live Writer showing the new design, fonts, and sizes. 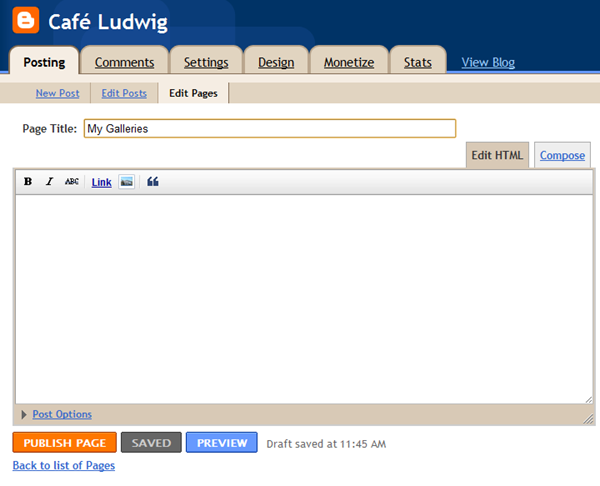 If you are reading this at Live Writer Basics click Café Ludwig to see this post over there – and vice versa. Static pages can be quite useful beyond the “About Us” or “Contact Us” pages that are so common. This blog has a “Resources” page and there are many ways to enhance a blog with pages. 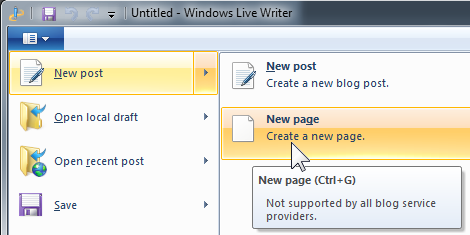 Creating in page in Windows Live Writer is just as easy as preparing a blog post – if your blog is hosted by WordPress. Just click the File tab, move the pointer down to New post and over to the right to Page page. Hovering on New page brings up the screen tip balloon. It show the keystroke for initiating a new page, Ctrl+G, and also a disclaimer: “Not supported by all blog service providers”. For a WordPress blog page, just create the page as easily you would a regular post, then publish it as you would a post. You may want to arrange the menu location in your WordPress Dashboard. That’s all there is to it. 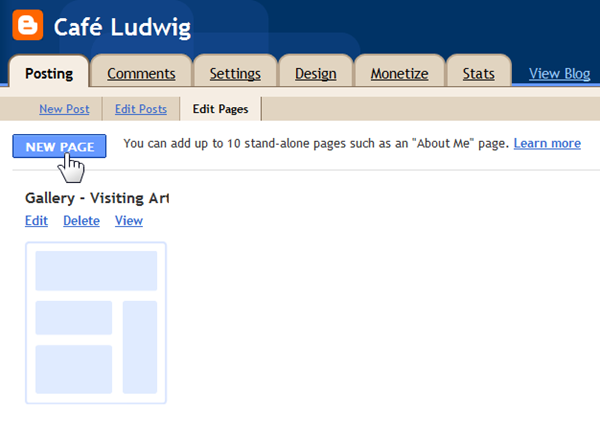 In your Blogger Dashboard click the Posting tab, then Edit Pages. Click the NEW PAGE button. Give the page a title, then click SAVED to save the page as a draft. The actual page composition can now be done in Live Writer. Instead of creating a page as you would for a WordPress blog, just prepare a post draft with all the information you want on the page. When the page is done, copy the HTML source code and paste it into the Blogger editor – I will come to the details shortly. There is one very important “gotcha”: Any images must be sourced “From the web…”. The reason is, Live Writer will not be used to publish the page and so it can’t upload your images. Upload the images manually. I like to upload images to my SkyDrive and source them from there. Since SkyDrive provides a generous amount of storage this is an efficient place even though getting the image URL is a bit of a hassle. See my post “Sourcing content for your WordPress gallery page” for the details of getting the image URL for a picture on your SkyDrive. When you have finished the page in Live Writer, click on the Source tab in the lower left of the window. In the source window, select all the code, use Ctrl+A. Then copy the code onto the clipboard with Ctrl+C. Now go back to your Blogger Dashboard and edit your page draft. Be sure the Edit HTLM tab is selected. Just paste the code from Live Writer into the main window, use Ctrl+V. You can inspect the looks of the page with the Compose tab. Then publish it with PUBLISH PAGE. These steps don’t really add any extra work as you would have had to do most of the steps anyway if you used the Blogger online editor. Using Live Writer makes the preparation of a page as easy as preparing a post, the publishing steps are not much of a chore. Of course, you can keep the draft copy of the page so you can come back in the future to add to it or modify it. 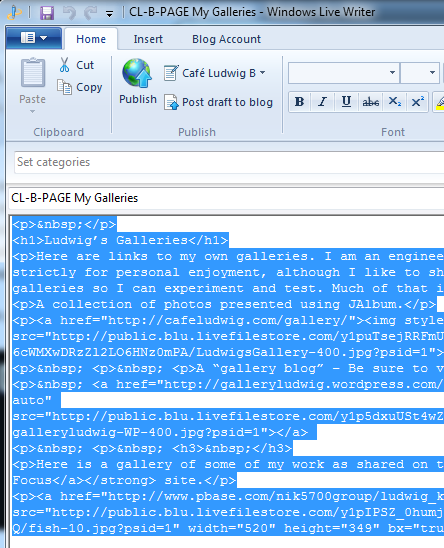 The illustration here shows part of the HTLM code (the right portion is cut off in the image) of my page “Ludwig’s Galleries” of my Blogger blog Café Ludwig. A number of blogging services provide free blogs and others blogs at a modest cost. Here we will concentrate on two of the larger services: WordPress and Blogger. Setting up your blog is simple enough, the blogging services make that very easy, there are some items that you should consider carefully. Your blog is a website of your own. Blogger and WordPress set up your site when you sign up and you can define the details later and modify it to reflect your style and a “look and feel” that suits your topics. 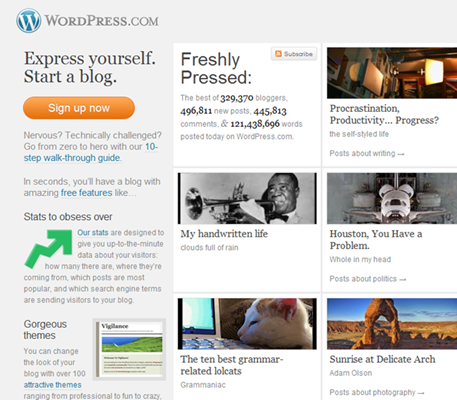 Here are images of the home pages at Blogger and WordPress. Each has a button to get you started. The next page is similar a sign-up page for getting an email or similar account. Your first decision is to select a web address for your blog. Such addresses take the form myblog.wordpress.com on WordPress, on Blogger it is myblog.blogspot.com. The hard part is the “myblog” name. Most people select a term that is descriptive of what the blog is all about – this blog here uses “livewriterbasics” because this is the general topic. There is nothing wrong with a whimsical name. Many people use their own name for their blog address. As you would expect, to get a blog account you need to a user name and password so you can log into your account securely. The blogging service also needs an email address so information and other communications can be sent to you. That is about it, click Sign up and your blog will be set up. The blogging service takes you to your “dashboard”. Here the various account and design details can be taken care of. 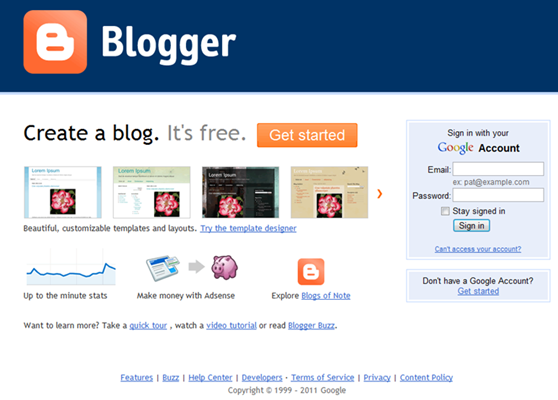 Each blogging service has a default design. Your blog will be set up with that design. You can make changes later but some you should do right away. For a WordPress blog go to the General page (under Settings in the navigation pane on the left). Here you can assign the title that should be featured on your blog. There are other choices and options, but this blog is about Windows Live Writer, there are numerous other sources that can help you with the details. Each blogging service has good tutorials that get you going. Take advantage of those help tools. You can create and publish posts from your blog dashboard. Windows Live Writer makes that a lot easier. So this will suffice for this post. 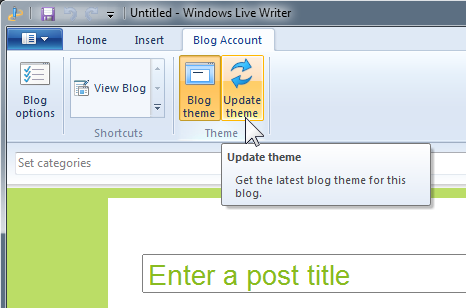 How to get going with Windows Live Writer is the topic of another post.